← July 1st – Happy Canada Day from Souris, PEI! We totally enjoyed the fireworks last night – considering Souris is a town of about 1300 people, they sure put on a good show! We were very impressed with the quality of the fireworks. Today was the big day – moving day, I guess! We were scheduled to have the boat dropped in the water at 11:00 but because it was supposed to get windy later on, Peter (the man who is responsible for running the travel lift) suggested that we start a bit early. 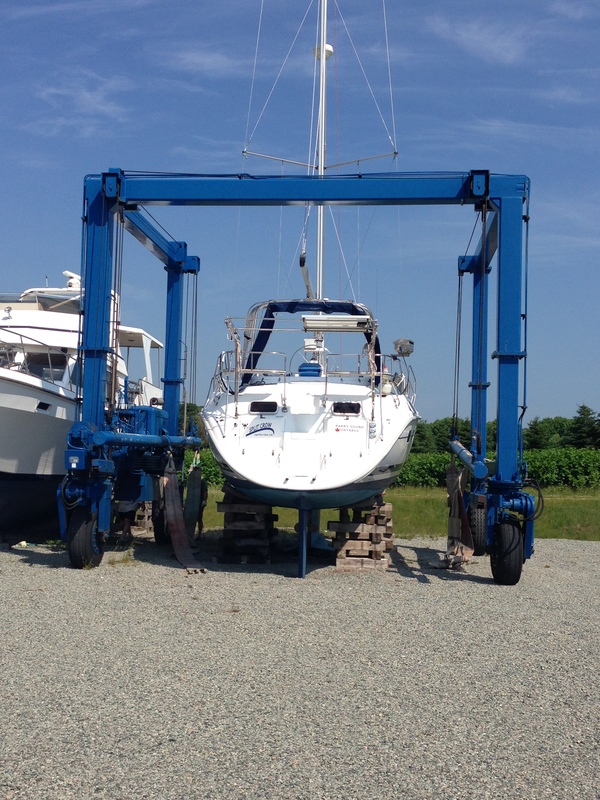 So, he quickly drove over to the boatyard with the travel lift and proceeded to bring the boat down to the water. Here’s the video of the Split Crow moving down from the parking lot to the water. I’m entering the movie in Cannes next year. Here’s a picture of it when he was picking it up. 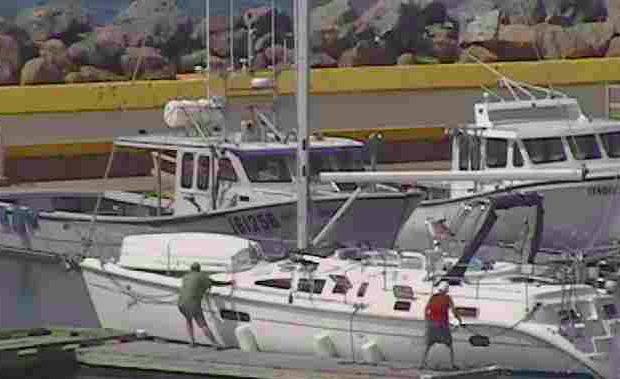 He took the boat all the way down to the wharf. It is about 0.65 of a kilometre (I measured it on my bike). He was an excellent driver and really knew how to manoeuvre the travel lift. I took some videos of the procedure and will post that at a later date once I edit them to a reasonable length. Here’s another picture of the boat on its way. A few people came to watch and Tom made himself useful by hopping on the boat once it was in the water. I thought that this was pretty funny because of course I was busy videoing the whole thing and forgot about getting on the boat. 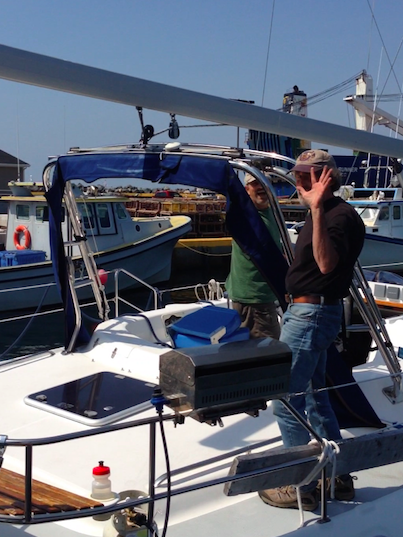 I had to share this picture of Tom waving goodbye! He and Dennis brought the boat over and here is a picture that Glen and Jo took from Parry Sound. They were watching the entire show on the web cam. Pretty neat! That’s all the excitement for the day!